Memphis, TN (May 11, 2015) — The Memphis, Tennessee-based Soulsville Foundation’s Stax Museum of American Soul Music and Souleo Enterprises launch Stax: Visions of Soul – a visual art exhibition celebrating songs from the iconic Stax catalog – July 17 through December 31, in what is the museum’s first contemporary art exhibition in roughly a decade. Specially commissioned works by 16 painters, sculptors, and new-media artists will be on display. The works were created in response to socially conscious music from the Stax catalog by recording artists including Otis Redding, Isaac Hayes, Mable John, and The Staple Singers. Participating artists include Aanisah Hinds, daughter of Grammy-winning singer Macy Gray, and Willie Cole, along with award-winning Memphis artists Brantley Ellzey, Frank D. Robinson, Jr., and Tobacco Brown. “We are honored to present this exhibition as it relates to our mission of ensuring that the Stax legacy is always remembered for its emotional power and bravery in addressing relevant societal issues. The visual art presented here is yet another opportunity to demonstrate how the music of Stax has helped shape the world,” said Stax Museum Director Lisa Allen. An opening reception will be hosted at the museum on Friday, July 17, 6-8pm. During the exhibition’s duration the museum will host free programming including an interactive art making workshop and panel discussion with music experts and exhibiting artists, with moderator Souleo, the exhibit’s curator. The exhibition debuted in Harlem, NY during the summer of 2013 as part of the multi-gallery visual art experience Motown to Def Jam, presented in partnership with ArtCrawl Harlem, La Maison d’Art, The Sol Studio, Strivers Gardens Gallery, and LeRoy Neiman Art Center. 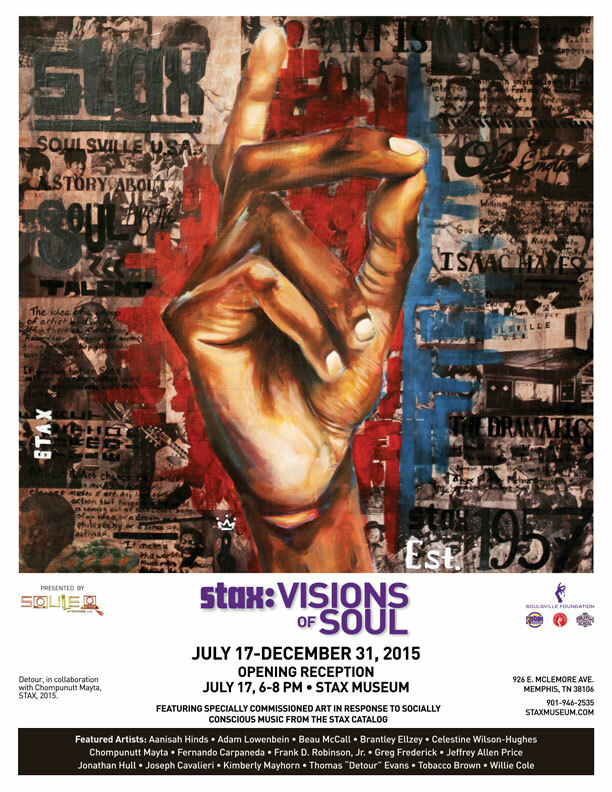 Stax: Visions of Soul features select works from the original exhibition along with newly commissioned work.